Every year on 10 December, Human Rights Day is celebrated globally. This year marks the 70th anniversary of the Universal Declaration of Human Rights, first adopted in Paris in 1948. The United Nations General Assembly proclaimed the Universal Declaration as a common standard of achievement for all peoples and all nations. It sets out fundamental human rights to be universally protected, including the right to privacy. The right to privacy is an important enabling right – it enables other rights to be fully realised, such as the right to equality and non-discrimination, and the right to freedom of expression and assembly. Privacy is also an essential precondition for human beings to discover and develop their own personality, by allowing them to determine how they interact with the world. Information privacy, for example, is a person’s ability to exercise control over their personal information, including what information is shared, with whom, and the purposes for which that information is used. In our world today, this notion of information privacy is becoming increasingly important – our personal information is being collected at a greater breadth and volume, and sometimes used in ways that go beyond the original purpose of collection, often without our knowledge or consent. Given the value of personal information, it’s vital that organisations collecting and using this data take steps to protect it. In Victoria, information privacy is protected under the Privacy and Data Protection Act 2014, which sets outs the minimum standards for how Victorian public sector organisations should handle personal information. The right to privacy is also enshrined in the Charter of Human Rights and Responsibilities Act 2006, which requires the Victorian public sector to take the privacy rights of Victorians into account when making decisions. 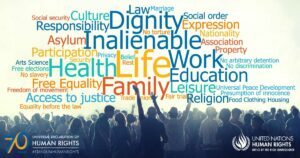 To commemorate the 70th anniversary of the Universal Declaration of Human Rights, the United Nations’ Office of the High Commissioner for Human Rights has published a series of short articles to put each of the Declaration’s 30 Articles into perspective. The article on the right to privacy is available here. OVIC also celebrated Human Rights Day by hosting a public forum on data ethics. We were joined by Australia’s Human Rights Commissioner Ed Santow from the Australian Human Rights Commission, and Max Miller from the Victorian Centre of Data Insights, for what was a highly interesting and informative discussion. A recording of the event is available here. As we celebrate Human Rights Day, let’s remember that privacy is everyone’s responsibility – today and every day. Comments can be made anonymously, however you may choose to leave your name. We will not use this information for any other purpose than to publish your comment. For more information about the privacy of your personal information and how to access it, please refer to our website privacy statement. Please respect the author of these posts and other contributors when leaving comments. Your message will only be visible after moderation. I would like to publish my comment anonymously.